Corned Beef Hash is as much appreciated by my restaurant guests for breakfast as is a dinner of Corned Beef and Cabbage. Saint Patrick's Day is undoubtedly the greatest day corned beef ever knows, but the day after St. Pat's is the perfect time to use the remaining corned beef to make a breakfast delight that nearly everyone loves. 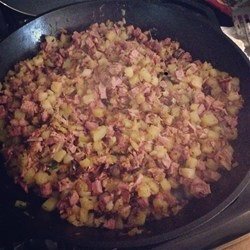 Hash is simply a mixture of beef (most often corned beef or roast beef ), onions, potatoes, and spices that are combined and cooked. 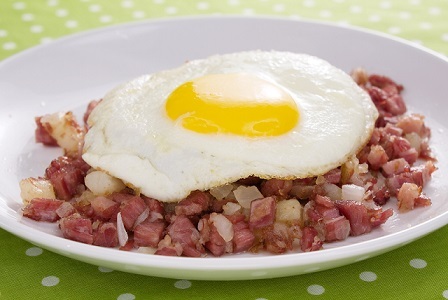 It is not difficult to use your leftover corned beef to make your own delicious hash. Add onions, potatoes and some seasonings and serve with an egg or two, some buttermilk biscuits or toast. Serve the hash with eggs and biscuits or toast. *One way to add eggs to the meal is to make 4 indentations in the top of the hash with a spoon before removing the hash from the pie plate. Break an egg into each indentation, salt and pepper the eggs and then return the hash-egg combination to the oven at 350 degrees F for 15-20 minutes or until the eggs are set (done). Remove the pie plate from the oven, slice the meal into 4 wedges and serve garnished with parsley sprigs. 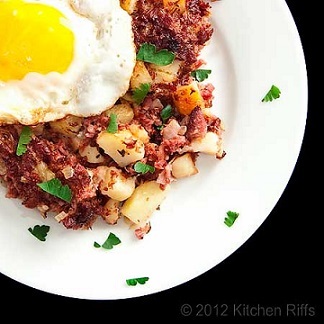 Enjoy your Corned Beef Hash and the company of those you share it with!